For the past several years, CaringKind (formerly the Alzheimer’s Association, New York City Chapter) has been involved in several efforts to apply palliative care practices for people with dementia living in residential settings. 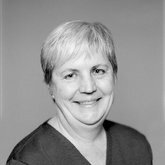 While palliative care in general has been slow to be adopted in residential care, it is also true that the potential value of palliative care for people with dementia is not widely understood. This disconnect is likely a contributing factor to the underuse of palliation in residential care, since in New York State alone well over half of the people living in nursing homes have a diagnosis of dementia, as is the case across the country. In the first place, although families and staff understand that Alzheimer’s and other dementias are progressive, they don’t always realize that dementia involves a physical process of brain and body deterioration that ultimately results in death. When faced with decisions that involve life-prolonging treatments, families often don’t fully understand that most such treatments are not beneficial to someone with advanced dementia, because they will neither improve the quality of life nor increase survival. As providers, we need to help families understand that in the absence of a cure, a comfort approach to care can have a significant and profound positive impact not only on the life of the person with dementia, but on their families and friends, and on staff as well. Secondly, the average time between diagnosis and death is eight to ten years, but it is extremely variable and can last up to twenty years or more; typically, about 40% of this time is spent in the advanced stages. This means that a focus on comfort should play a role, sometimes for years, long before the last few weeks or months of someone’s life. we need to help families understand that in the absence of a cure, a comfort approach to care can have a significant and profound positive impact not only on the life of the person with dementia, but on their families and friends, and on staff as well. Finally, it is also crucial to understand that specific modifications in how palliation is offered to people with dementia are required to ensure its effectiveness. While there is no cure for dementia, there is much that can be done to bring someone comfort and to prevent or minimize the discomfort, distress, and suffering that sometimes accompany the effects of dementia. Throughout the course of the illness, the needs of the person with dementia obviously change. What makes the more advanced stages especially challenging is that the person has increasing difficulty in expressing his or her problems/needs, be they hunger, pain, constipation, need to use the bathroom, too hot or too cold, tired, lonely, or frightened by noises or activity in the environment. As an individual’s dementia advances, his or her actions and behaviors, rather than words, are most likely to communicate distress. Unfortunately, all too often these behavioral expressions (moaning, calling out, striking out, grimacing) are not understood as signals of pain or distress; rather they are often assumed to be the inevitable consequences of the dementia itself. However, dementia is rarely the actual cause: individuals suffering from dementia are no longer able to understand or describe in words the cause of their distress, and can only express their needs through behaviors like moaning, wandering, refusing to eat or move, or striking out. Not only can’t they tell us what is wrong, they can’t fix it. We must do that for them. Palliation cannot occur if the reasons or triggers for distress are not known or understood. Anti-psychotic and anti-anxiety medications do not take away pain, nor do they provide comfort if someone living with dementia is distressed due to factors listed above. Long-term care providers therefore need to develop tools and processes which focus on identifying the cause of the distress, and then using tools and implementing strategies for preventing or ameliorating these causes. Dementia-capable palliative care applies dementia-specific practices and tools to evaluate and to respond appropriately to distress in people with advanced dementia. In particular, this means (1) using a behavior-based pain assessment tool as part of overall facility pain policies and procedures; (2) using regularly scheduled, rather than PRN, orders for pain medications; (3) offering food in small, manageable amounts, especially finger food, throughout the day and evening, for those no longer able to negotiate regular mealtimes; (4) being flexible with regard to rising, eating, bedtime, and other routines; and (5) paying attention to the need for a delicate balance of stimulation activities and rest in the environment of the person with dementia, as well as to his or her individual needs throughout the day. A primary focus of our efforts over the last several years has involved helping to bring a comfort approach to care for people with dementia to three New York City nursing homes. This approach, Comfort Matters®, was developed by The Beatitudes Campus in Phoenix, Arizona, and is notable for the degree to which it has identified the types of organizational changes that need to be in place in order to successfully support caregivers at the bedside to provide responsive care to people with dementia. 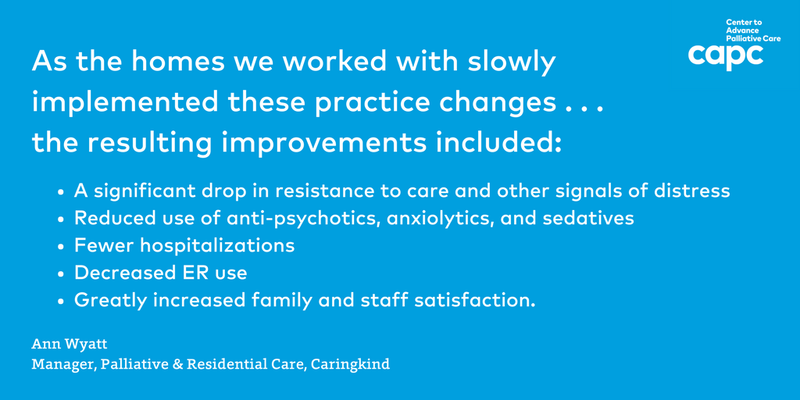 As the homes we worked with slowly implemented these practice changes, such as behavior-based pain assessment tools and flexibility in daily routines, the resulting improvements included: a significant drop in resistance to care and other signals of distress previously manifested by many residents; much reduced use of anti-psychotics, anxiolytics, and sedatives; fewer hospitalizations; decreased ER use; and greatly increased family and staff satisfaction. For further dementia care resources, visit CAPC's Dementia Care Curriculum, with courses and resources for both members and non-members!